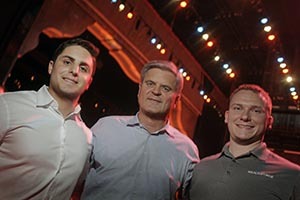 The cofounders of WealthForge, Matt Dellorso and Fred Bryant, edged out seven other Richmond area startups Monday to win a $100,000 investment from AOL icon Steve Case. The announcement of the winner of the pitch competition was the capstone event of a day that promoted entrepreneurship during Case’s Rise of the Rest tour in Richmond. Richmond is the first stop on a five-city tour that Case is doing around the South, and the pitch competition drew about 300 people. Dellorso and Bryant, who started their company in a dormitory room at the University of Richmond in 2010, said they will use some of the capital to open a larger 8,000-square-foot office in downtown Richmond for the company’s 35 employees. “This would pay the first year’s rent,” said Dellorso. Currently the company, which processes private placement transactions, operates out of a space in the Paragon Office Park in Henrico County. Watching the competition in the Gottwald Playhouse at Richmond’s CenterStage called up images of the television show, “Shark Tank.” The startup executives had four minutes to explain their company’s mission and business model, with presentations followed by three minutes of sharp questioning from a panel of judges. From chick peas for a vegetable protein business to baby slings and a banking platform for contract workers that takes deductions from paychecks for federal income taxes, the presentations offered a broad look at some of the new companies being launched in Richmond. Dellorso described WealthForge as “the PayPal for processing private transactions.” He said his company makes it possible for private businesses to seek private placement capital online -- one of their largest sources of capital -- instead of going through a lot of paperwork with a registered broker dealer and a lawyer. “The private placement market [hadn’t] changed since 1933,” he told the judges, until WealthForge came along. According to Dellorso, the company closed $51 million in transactions last year and is currently supporting about 40 clients in real estate, agriculture, technology and health care. “We are growing every single month,” he said. Nearly 60 other independent, registered financial representatives also use WealthForge’s platform, he added. In an interview after the competition, Case said WealthForge stood out because “of its momentum and traction.'' Already having partners and clients in place is important, and the judges liked the company’s crisp presentation, Case noted. “These were eight excellent companies, and it’s always a challenge to pick one,” he added. • Vibeats – a mobile web platform for dining reservations. Besides Case, the chairman and CEO of Revolution, a Washington,D.C.-based investment firm, the judging panel included Tige Savage, the cofounder of Revolution; Aneesh Chopra of Hunch Analytics, who is the former U.S. chief technology officer; and several successful Richmond entrepreneurs. Representing this group was Ting Xu, founder and chairman of Evergreen Enterprises; Aaron Montgomery, founder and chief operating officer of CarLotz; and Eric Edwards, chief medical officer of Kaleo. This is the Case’s third “Rise of the Rest” tour. While the $100,000 awarded in each city will come through Revolution, the money is an equity investment from Case himself. Case says he hope the investments will be a “catalyst for other investors." Tour locations are chosen, he said, because “we feel they are at a tipping point, where there’s good [entrepreneurial] momentum and over the next decade it could accelerate." The Richmond tour began Monday with a breakfast at Urban Farmhouse restaurant in Shockoe Slip, where Virginia’s dignitaries lauded innovative efforts in Richmond and Virginia. The event showed that Case, the cofounder of America Online, can still draw a crowd with Gov. Terry McAuliffe, Virginia U.S. Sens. Mark Warner and Tim Kaine, Richmond Mayor Dwight Jones and Virginia Secretary of Technology Karen Jackson all in attendance. Mark Warner, a co-founder of Nextel Corp., said he felt two federal issues could help promote entrepreneurship in the country: a rational immigration policy and regulations to allow crowdfunding. Congress has passed legislation, The JOBS Act, that would allow small businesses to use crowdfunding to raise capital, but the U.S. Securities and Exchange Commission has delayed writing regulations that would allow for the practice. “Crowdfunding would be an important tool,” said Warner.